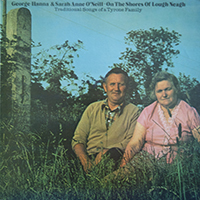 “Many recordings of Ulster folk songs have been issued, but little or none from the Co. Tyrone. This record presents a sample from the repertory of a brother and sister, who come of a singing family within a singing region from which they have never moved. They are the carriers of a distinct and beautiful style. They are supported by their enthusiasm for songs which attract other singers who, with them, make a community within which an interchange of ideas is continually taking place. A delightful illustration of this is that Sarah Anne’s changes to John Reilly on track 9 are so pleasing to Brian Mullan, who gave her the song a year or so ago, that he plans to relearn it from her! Both these singers are intensely creative but in different ways. Geordie possesses the family style to a much higher degree than his sister. It entails a breaking up of the tune and words into short phrases delivered with great force. It is also distinct in the placing and shape of the decoration. This results from the shortness of the phrases and allows a highly meaningful performance without any overstatement. Sarah Anne’s ability to tidy up the words of a song or to lilt a tune to unsung verses complements Geordie’s skill and the two interact; they sing a large number of the same songs, share the same style and adopt one another’s changes. In short, these two singers represent the living tradition not its dying kicks.” from the original 1978 sleeve-notes.